Heat butter in a heavy Bottam Pan, add cashew nuts, soaked rice & saute few mins. Add milk ,cardamom & allow to boil upto almost done. Add condensed milk & sugar. Mix well & garnish with raisin. Oh! Rice pudding looks creamy and delicious! Nice clicks! Wow nice dish i love this.By adding condensed milk it gives nice taste. 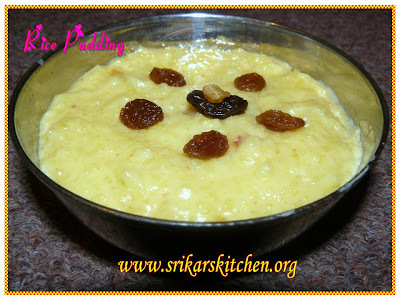 Looks delicious Sri..Just posted coconut rice pudding..
love the raisins on top! condensed milk would hv made it more delicious.I prepare all my sweets with condensed milk only. Pudding looks delicious!I'm craving for it now..
looks delicious..with all the raisins on the top.. Your kheer sounds delicious. I'd love some right now. 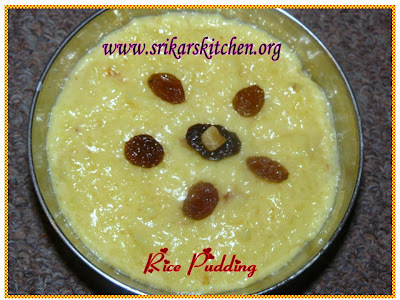 Delicious rich and creamy rice pudding!!lovely! pudding looks yummy..nice color too!! Lovely dessert recipe! Looks creamy n yummy! I love rice pudding....looks creamy and yum. very rich and yummy. sure a try panren. Very Rich and creamy.... Looks delicious! Rice pudding is one of my favourite desserts. Looks so yummy and lovely color and presentation. Creamy and rick pudding. Very inviting.